Our general skating sessions run from Friday evening to Sunday afternoon. If you don't have skates of your own, then the skate hire counter is where you'll be heading! Just make sure that you ask for either skates or blades when you pay for your entry. You'll be given a ticket then directed to the skate hire counter where you'll be given your boots. If you have any troubles putting the skates or blades on, then one of our friendly and experienced staff members will be able to assist you. Just remember: Feet together, hands out in front, head up and small steps to begin with! You'll be having a blast in no time! During each session, our DJ will organise games, dances and other activities dispersed throughout the general skate portions of the program. In the likely event that you're at the rink when someone's having a birthday party, then please help us sing happy birthday to them when we bring out their cake! For more information about celebrating a birthday at Stafford Skate Centre, please have a look at our Birthday Party page via the menu at the left of your screen. 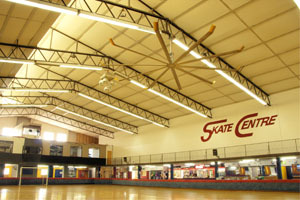 The most recent addition to Stafford Skate Centre is our HUGE fan to keep you and your friends cool while on the rink! So not only will you be having fun out of the sun, you'll be cool while you're doing it, too! So come on down to Stafford Skate Centre! There's never been a better time! Bring your whole family! You'll find our session times below. Please note: Skate and/or blade hire is not included in the admission price. Skate hire = $3.00/person, Blade hire = $4.00/person. Admission: $13.00/person (admission to the general session following the class is included in the admission price). All other evening and weekend sessions run as normal. your child/children at the rink unattended.